Dr. Chinmaya Sahu has been a meritorious student throughout. Having completed his undergraduate and postgraduate training from Nair hospital in Mumbai, he trained in Vitreo-Retina from the prestigious Sankara Nethralaya, Chennai. 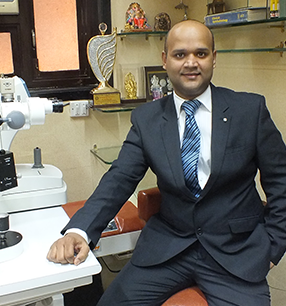 He then worked as a consultant in the renowned L.V Prasad eye institute, Hyderabad. He combines the best of the two premier institutes and is the first Vitreo Retinal Surgeon to have such a training. He is accredited by the American board and has also passed his F.R.C.S (Glasg) and has the distinction of having over 11 degrees to his name. He specializes in the management of complicated Retinal cases like Vitreous hemorrhage, Retinal detachments and has thousands of retinal surgeries to his credit. His area of further specialization is complicated Diabetic Vitrectomies. 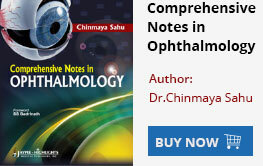 He has authored a text book, ‘Comprehensive notes in Ophthalmology’ for post graduate students and has also has authored the section on ‘Uvea’ in an international text book, ‘Clinical Ophthalmology’. He also has many publications and presentations to his credit. Assisted over 1000 Vitrectomies and 50 Scleral buckles. Done all types of Retinal surgeries including RD, TRD, Combined RD, Post trauma Scleral tear, IOFB, Endophthalmitis, Macular hole, Epiretinal Membrane, Recurrent RD. Comfortable doing both 20 G and 23G sutureless Vitrectomies. Performed over 1000 laser procedures. Gave an invited talk on ‘Newer diagnostic tools in Vitreo-Retina’ in ‘Pearls of Retina’ session at AIOS 2011, Ahmedabad. Presented paper on “Comparison of foveal thickness, photoreceptor layer thickness measured using SD-OCT (Copernicus) between normal population and patients with Diabetes Mellitus without Diabetic Retinopathy. Presented paper on “A unique case of dog bite” at BOA premises, Mumbai on May 2006. Presented free paper on “Comparison of 3mm Superior SICS Vs 3mm Temporal SICS” at AIOS, Bhopal in February 2006. Presented paper on “Relation of type of incision and post-operative astigmatism” at Staff Society Meeting of B.Y.L.Nair Ch Hospital at B.Y.L.Nair Charitable Hospital, Mumbai in August 2005. Won the First prize. Worked as Ophthalmologist on the project titled “Modelling the need for Diabetic Retinopathy screening” which was a collaboration between the International Centre for Eye Health at the Londons School of Hygiene & Tropical Medicine and Vision Research Foundation, Sankara Nethralaya. Participated in a one week workshop on ‘Biostatistics and Epidemiology’ conducted by M.G.R University in Spetember 2008. Helped in organizing the “Paediatric Ophthalmology CME at B.Y.L.Nair Ch. Hospital” in March 2006. Sub investigator in A Clinical trial of Multi-National Pharmaceutical Company from February 2006 till date. Helped in organizing the “Bombay Ophthalmologist’ Association Annual Conference” in November 2005. Helped in organizing the “CME of Bombay Ophthalmologist’ Association at B.Y.L.Nair Ch. Hospital” in June 2003. Helped in organizing the “Bombay Ophthalmologist’ Association Annual Conference” in December 2003.